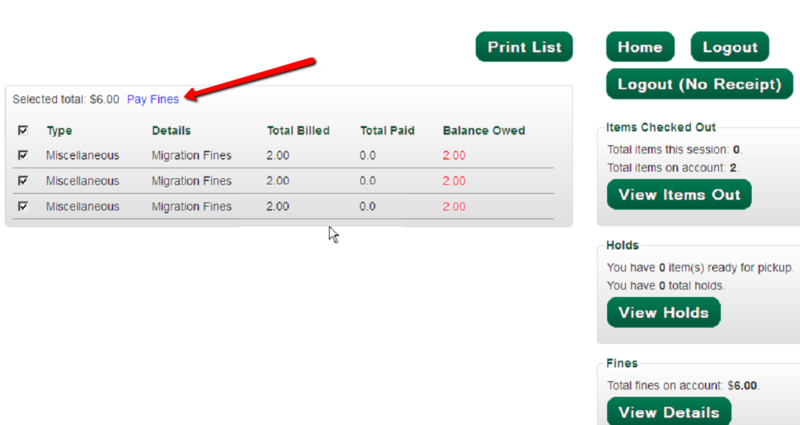 In the EG simple self check interface, the "Pay fines" link under Fines->View Details should be a button, like the other UI elements. The LINK is harder to pick out and harder to press using a touch screen interface. Also, the check boxes should be larger, to make them easier to activate with a touch screen interface. For enlarging the checkboxes, this seems to do the trick. Marking as a wishlist enhancement and targeting towards 2.next. The fines button and enlarged checkboxes are separate commits to make it easy to only accept one or the other. We have been using both of these changes in production for 10 months without any issues. I like it! However, the larger checkbox sizes, which looked nice in Chrome, came across as very blurry on Firefox (see screenshot). I tweaked the style for Firefox to get a larger than usual checkbox without the blurriness. If it looks good to you Josh, could you sign off on my commit so that I can merge this for 2.12? Thanks for testing and for the firefox adjustment. I think the size you picked is a good compromise. In the future I may try to replace the default checkboxes with higher res images so they can be a little larger without being blurry. Thank you Josh! Merged to master for inclusion in 2.12!